Some people (Penny Nash among them) have asked me whether they get a sticker for voting in Lent Madness. Evidently this is customary at some polling places around the country. Unfortunately here at Lent Madness we don’t have fancy stickers, just mugs and books. 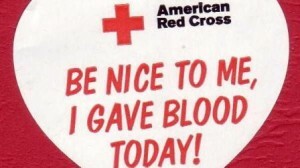 However if you really want a sticker with a cross on it, I do have a suggestion: go give blood. Your sticker will inevitably bear a red cross but that’s rather holy looking, I’d say. Plus, percentage-wise, give blood and you’ll have an excellent chance to score some Cheez-Its. Speaking of giving blood, Florence Nightingale actually made it into last year’s Lent Madness and defeated St. David before succumbing to Clare of Assisi in a very close Saintly Sixteen battle. If any of you saintologists are into Lent Madness nostalgia, you can read about it here. But seriously, we’re delighted that so many of you have been voting — we’re averaging about 2,000 votes per contest so far — and commenting. Keep it up! The comments alone are worth reading through. We love hearing why people are motivated to pull the lever (proverbially) for a particular candidate or what other tidbits they may know about the saints involved. Plus, we encourage trash talking. Keep up the voting and thanks for helping make the first few days of Lent Madness so much fun! 1 Comment to "Stick(er) it to Me"
God bless Tim and Scott for providing Lent Madness and all who vote and all who comment and discuss their votes and those whose votes are known to you alone.